Minerva (formerly Flora) & Loki were born in CP care on 17/05/16 to a heavily pregnant stray signed into CP care in the nick of time. They were adopted when they were 9 weeks old on 22/07/16 by Heather & Dave and it seems the new arrivals are clearly in charge! After their first weekend with the kittens, Heather said "I thought I'd just drop you a quick line to let you know how the kittens are doing - they've settled better than I ever imagined. From the moment they left the cat carrier, they've been busy exploring and playing together interspersed with sleeping. They're eating and drinking well, and haven't even had 1 accident outside the litter tray. Both kittens greet us in the morning, purring loudly. Minnie from the off seemed determined to be a lap cat, settling of her own accord on my lap for some quality snoozing. Loki initially preferred to lie next to me but as I'm typing this he's settled with his head on my lap. They love their toys, particularly the mysterious red dot of the laser toy which magically disappears just as they think they've caught it. I'll make sure I email you some photos soon, once I can get to my laptop - at the moment my lap is fully occupied by sleeping kittens. We feel so blessed to have them." What contented and happy kittens - that seems to go for the owners too! 05/08/16 - another fabulous update of these gorgeous kittens and they are certainly up to lots of mischief. Heather & Dave say "I thought you might like an update on Loki and Minnie - as you can see from the photo they are growing fast. Their individual characters are really coming out now and it is Minnie who is the dominant personality, often taking Loki's toy or pushing out of where he is sat so she can take his place. Loki still starts most of the kitten bundles when playing though! Loki is turning out to be quite a talker whilst Minnie is gaining a reputation as the fearsome explorer, prepared to investigate anything and everything. She nearly came a cropper when she tried to join my grandson in the bath - luckily his mum caught her before she got rather wet!" 21/08/16 - Another milestone in the kittens lives as they had their had their 2nd injections just over a week ago and were checked over by the vet. Loki now weighs 3.5 lbs and Minnie 3lbs and are in excellent health - the vet noted that they were putting on weight nicely and not carrying any fat. Heather says this isn't surprising given how much energy they have! Their colouring is changing slightly and both have developed white chins, Loki especially. Minnie's light grey stripes are becoming larger and they are definitely fluffy! An update of siblings Lottie & Ffion is also on the success stories page and Heather noted it was interesting seeing their pictures to compare. It's hard to believe, but Loki and Minnie are nearly 6 months old! Here they are - for once being still and looking at the camera! I'd just like to recommend people keep an eye on the incision area of a spayed cat for several weeks after their op. As you know, Minnie had no problems but last week I noticed a purple 'thread' in her shaved area. It turned out that one of her internal stitches had pushed an end out through her scar, and a length of plastic suture material about a centimetre long was protruding. Luckily she hadn't pulled at the 'thread' and there was only a pin prick hole in the scar - the vets trimmed the thread once they were sure there were no other problems. There had been no sign of anything there even 24 hours before and the vet explained this can sometimes happen. I'd just like to make sure other cat owners are aware and keep an eye out for any problem! You can see Loki is still getting bigger - he's a very long cat and shows no sign of slowing his growth! Minnie continues to get fluffier wherever her fur is the tawny colour! They're both healthy and happy, loving to play and 'pretend' hunt. Their new favourite are 'kitty bubbles' which stay whole until the kittens track them down, then pop as they touch them - they seem to like the peach flavour! More gorgeous photo's from Heather who adds that when Minnie went to the vets Loki went too and they were much admired and cuddled by the vet nurses! Wow! Look at the delightful duo now - at 10 months old, March 2017. Heather says "Loki has turned into a long boy with lots of energy - he still has his 'boy' swagger, until something startles him. He loves to get inside tight spaces, including a pillowcase that has a pillow in it! The biggest surprise with Minnie is her mane. It's still growing! She's an absolute lap cat who thrives on attention. Her favourite trick is to lie on her back in front of you, wiggling and asking for tummy rubs. At 10 months, we've still never heard her miaow, but she does chirrup!" They are absolutely gorgeous and it's just great to see them change and progress. 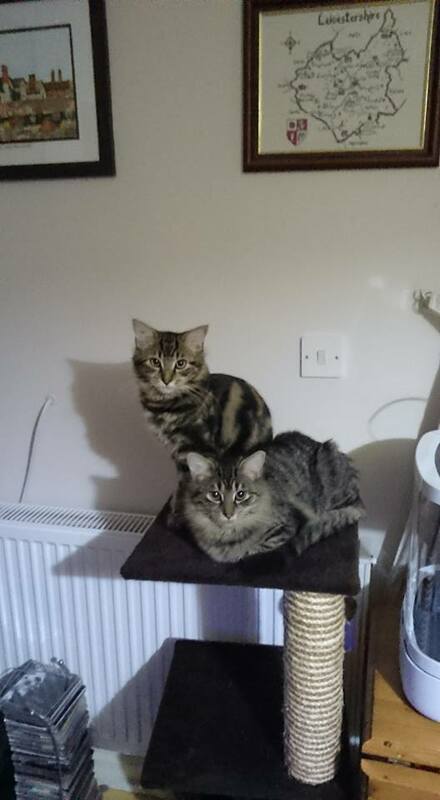 CP fosterer and mum of Loki & Minnie sent a birthday update on the gorgeous twosome. Can you believe that Loki and Minerva are 2 today? It doesn't seem possible! I've finally got over my trepidation (more or less) at letting them out and we had a cat flap installed about 6 months ago which they've both mastered. Minnie has her own individual way of opening it, as she prefers to use her front paws rather than her head! 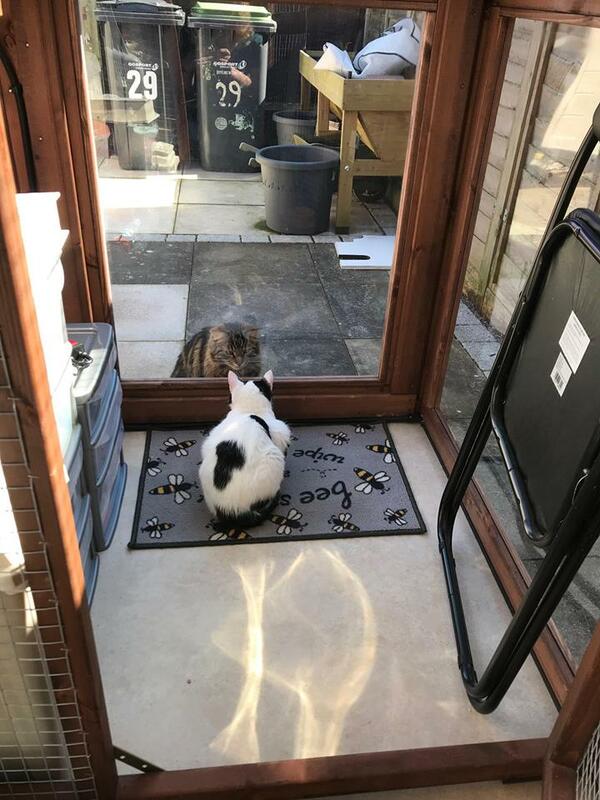 Loki definitely tends to roam further than Minnie, and has had a couple of confrontations with another male living close by but that seems to be simmering down now - hopefully the truce will be permanent! Both have remained very friendly - Minnie would be on my lap 24/7 if she could but Loki has decided he also likes my lap when he's in the mood. I did wonder how they would take to my fostering cats for CP but it's been surprisingly problem free. They'll come to the door of the pen and look at who's in there but there has been no hissing or bad behaviour - just curiosity! Loki was particularly fond of Emily as you can see from the photo. 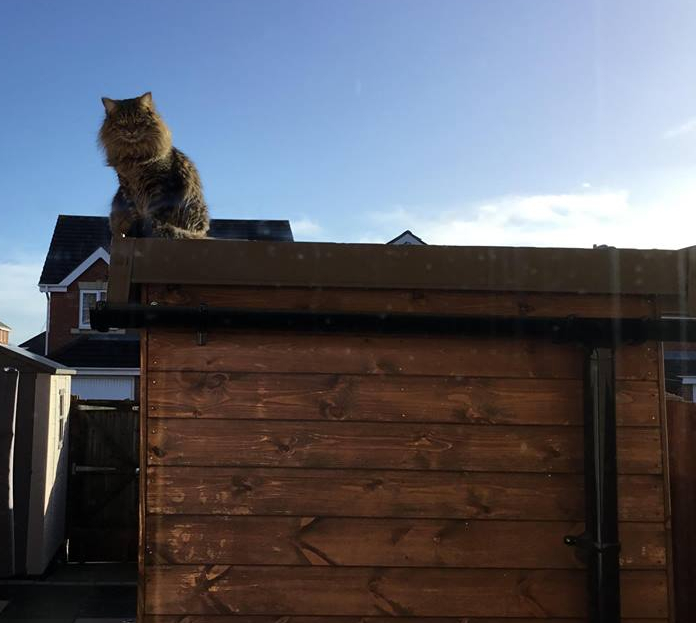 The pen also makes a brilliant lookout post, as Minnie is demonstrating! I knew adopting Loki and Minnie would have a huge impact but didn't realise how much joy they would bring - along with the occasional worry too, of course. As my being a CP fosterer is a direct result of their adoption, I think its fair to say they've completely changed my life and expanded my social circle to include the other crazy cat ladies of Gosport CP!